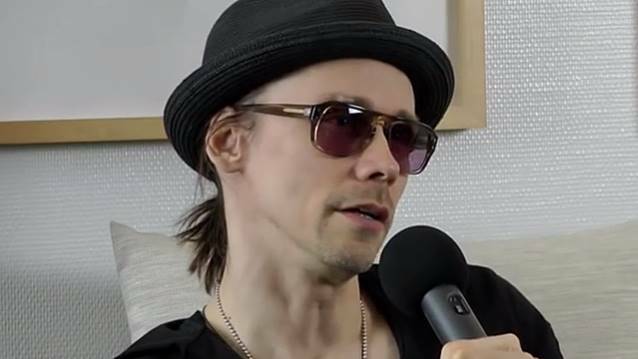 According to The Pulse Of Radio, ALTER BRIDGE and Slash vocalist Myles Kennedy almost added a third gig to his resume in 2008, and it was a massive one — working with the instrumental members of LED ZEPPELIN on a new project that never saw the light of day. Kennedy rehearsed and wrote music with guitarist Jimmy Page, bassist John Paul Jones and drummer Jason Bonham over the course of two sessions, telling VH1 Classic's "That Metal Show", "Those rehearsals I will remember to my dying day… We played 'The Rain Song', which is probably my favorite LED ZEPPELIN song, 'No Quarter', 'Kashmir'. It was a lot of fun." Despite rehearsing several ZEPPELIN classics, Kennedy was quick to point out that the project, had it come to fruition, would never have been called LED ZEPPELIN. He explained, "I don't know if they knew what it was going to be. They just wanted to play… they wanted to put a project of some sort together. They weren't sure what it was, but it was never going to be LED ZEPPELIN with a new singer, I mean, obviously." Kennedy told The Pulse Of Radio what it was like to play with the members of LED ZEPPELIN. "It was so surreal, it was just unbelievable," he said. "I spent the day there in a studio with those guys. playing songs, and next thing you know, I believe in September that year we got together again and spent what I like to consider probably the greatest week of my life playing with those guys. And any time I'm having a bad day, I think about those days and suddenly everything feels a lot better 'cause I got to experience that." Page and Jones were looking for a way to keep working following LED ZEPPELIN's incredible one-off performance at the O2 Arena in London in December 2007. Although there were rumors of staggering sums being offered to the group for a full tour, singer Robert Plant elected to continue with his solo career instead. Page and Jones also tried out AEROSMITH's Steven Tyler and SOUNDGARDEN's Chris Cornell, with Page telling Rolling Stone in 2012, "Various people thought we should go on tour. I thought we needed a good, credible album, not do something that sounded like we were trying to milk the (reunion)." Kennedy is currently on tour with ALTER BRIDGE in Australia and will lay down vocals for Slash's third solo album when he returns.